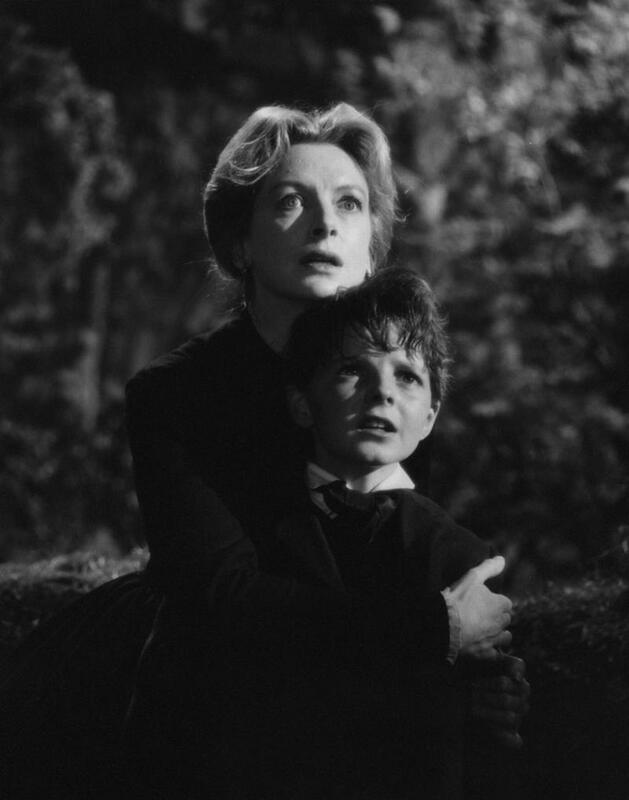 Nowadays, perhaps the most recognisable element of the soundtrack to Jack Clayton’s The Innocents (1961) is the haunting lullaby ‘O Willow Waly’, composed by Georges Auric and Paul Dehn, which is the film’s very first sound – even before the appearance of the 20th Century Fox logo (some projectionists apparently took this for a mistake and re-cut the opening before showing it). To modern audiences, the song may be uncannily familiar: a sample of the girl Flora singing it in The Innocents is buried in the crackle and hum of the cursed tape in Gore Verbinski’s US remake of The Ring. Watching Clayton’s film again though, what really disturbs us, at the very moments when the film is at its most disturbing, are the eerie electronic noises that creep around the edges of Auric’s lush impressionistic score. These noises, though unmentioned in the film’s credits, were created by Daphne Oram. Four years earlier, Oram had been the architect of the BBC’s Radiophonic Workshop, the soundhouse that would one day create the out-of-this-world music for Dr Who, Blake 7, and The Hitchhiker’s Guide to the Galaxy – not to mention countless science programmes, children’s broadcasts and local radio jingles. Oram had wheeled vast old tape machines and battered old war surplus oscillators from studio to studio late at night to experiment on the sly while working by day at the BBC, before a long campaign of lobbying had finally granted her a little room at Maida Vale, a long-cherished dream of hers. There, she and Desmond Briscoe would use the tape manipulation techniques of musique concrète in radio dramas such as Samuel Beckett’s All That Fall, and Giles Cooper’s The Disagreeable Oyster, before a trip to the Brussels World Expo in 1958 convinced Oram to leave the BBC and set up her own studio, in Tower Folly, a converted oast house in Fairseat, Kent. It was there that, in between experimenting with her own Oramics drawn-sound composition system, she worked on the music for The Innocents, along with a number of other films, adverts, ballets and theatrical productions. The image of a woman, dead for over a year, appears across a pond and we hear a rising tremolo of stacked sine tones, harmonised spectrally in just intonation; amid a babble of phantom voices, a door falls shut and the echo from its slamming noise swells into a dark cavernous drone. When we first hear the electronic sounds Oram created for this film, we are inclined to take them, much like those crafted by Delia Derbyshire for John Hough’s The Legend of Hell House 12 years later, as the noise of the ghosts that haunt the old house in which it is set. It soon transpires, however, that Oram’s special sounds are, on the contrary, the leitmotif of Miss Giddens’s creeping insanity, the theme to a certain panicked look in her eye. If the audience spend much of the film unsure whether the ‘monstrosities’ we see are truly phantoms or phantasies, spectres or symptoms, the redoubtable Ms Oram is clearly under no such uncertainty. If the electronic noises in The Innocents are the sound of encroaching madness, Oram has prior form. In the late 50s, the sound of a nervous breakdown was rather considered to be the Radiophonic Workshop’s stock in trade. The first BBC production to use the word ‘radiophonic’ – Frederick Bradnum’s ‘Radiophonic Poem’ entitled ‘Private Dreams and Public Nightmares’ produced by Oram along with Briscoe, Norman Bain and Donald McWhinnie – featured among its opening dialogue the ominous pronouncement, ‘I fall through nothing, vast, empty spaces. Darkness and the pulse of my life, bound, intertwined with the pulse of the dark world’. Accompanied by a ‘comet-like shriek’ and a ‘pulsating beat’, the piece realistically evokes the inner monologue of a manic depressive. Oram once compared, in her only published book, An Individual Note, the descent into madness with a kind of psychic feedback loop, an overloading ‘through having too high a playback volume’. It is in precisely this way, the echo of feedback overloading, swelling to the point of distortion, that she created many of the chilling sound effects for The Innocents.